Originally posted December 8, 2011 on the Qualia Folk Encyclopedia of Gay Folklife website by Mickey Weems. Lozen and Dahteste (pronounced Ta-DOT-se) were two Chiricahua Apache women that fought alongside the legendary Native American freedom fighter Geronimo. Although the biographies on Lozen and Dahteste are sparse in detail, their attachment to each other and the resemblance of their close friendship to a Lesbian butch-femme relationship has elevated the couple to iconic status in the Two-Spirit (orientation and gender-variant Native Americans) community. Lozen was a renowned medicine woman, possessing extensive knowledge of the medicinal properties of plants and minerals. She was also famous for her ability to detect her enemies by means of a ritual in which she sang, extended her arms, and turned in a circle until the palms of her hands tingled, a sign that let her know from which direction they were approaching. Upon Victorio’s death, she went on to join the famed Native American resistance leader Geronimo (Apache name: Goyatła, “One Who Is Yawning”). She eluded her capture many times until she was finally surrounded along-side Geronimo in 1886. She died as a prisoner of war at Mount Vernon in Mobile, Alabama of tuberculosis at age 50, never to see her homeland in the Southwestern USA ever again. Dahteste was a Mescalero Apache woman and companion of Lozen. Unlike the masculine description of Lozen, Dahteste was a well-groomed, beautiful woman who took pride in her appearance and dressed in feminine attire. Although she rode and fought just as well as Lozen, she was described as carrying herself with more sophistication. 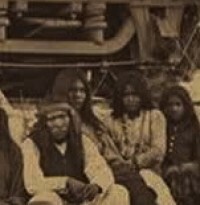 Dahteste was fluent in English and acted as translator for the Apache people. She also became a mediator and trusted scout for the U.S. Calvary. Her dual loyalties to the Apache people and the US Army did not keep her from being arrested alongside Geronimo in 1886. She was taken as a prisoner of war and shipped off to St. Augustine, Florida where she remained for eight years. While in Florida she managed to survive pneumonia and tuberculosis. There is one surviving picture of Dahteste and Lozen. 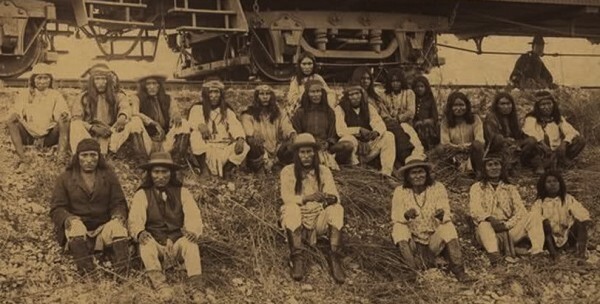 They are sitting close together, along with Geronimo and other warriors in front of the train that will take them away in cattle cars to exile in Florida. The physical proximity of the two women, however, is often disrupted by biographers, despite evidence of their companionship in battle and affection for each other. Their images are cut and isolated into two separate pictures, just as their biographies tend to downplay their emotional closeness to each other. Members of the Two-Spirit community have reintegrated the visual and biographical images of Lozen and Dahteste so that they are once again united. Comments? Post them on our Encyclopedia Facebook page. Perdue, Theda. Native American Women’s Lives. New York: Oxford University, 2001. Robinson, Sherry and Eve Ball. Apache Voices: Their Stories of Survival as Told to Eve Ball. Albuquerque: University of New Mexico, 2003. Roscoe, Will. 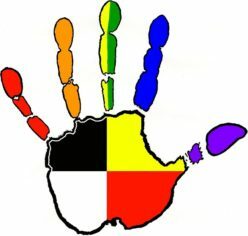 Changing Ones: Third and Fourth Genders in Native North America. New York: St. Martin’s, 2005. Next Next post: The Girls Run: A Review of the Mescalero Apache ‘Coming of Age Ceremony’ and the words written by Claire Farrer & Bernard Second”.